Hi Lo Campers are quite popular camper trailers, which were manufactured in Belville, Ohio. The company has started making these specific trailers in 1955 and they became know all over the USA quite fast. One of the most specific features of the Hi Lo trailer is that the upper half of the camper rolls down over the lower half. The campers have been designed this way to reduce wind resistance and make driving easier. They fold out on campsite offering a spacious interior. In 2010 the company stopped manufacturing these trailers, which makes them quite rare nowadays. - Size: One of the best things about this trailer is its small size. It is perfect for weekend getaways and it is easy to tow. It is fuel efficient and it won’t make driving more difficult. In the same time it offers quite a lot of space, with bed space for up to 4 people. It also offers the same comfort as other bigger RVs do. The Hi Lo Towlite travel trailer has a lot of facilities and amenities that make traveling a comfortable experience. - Weight: This model of Hi Lo Campers is lightweight. This makes it easy to it drive around and in the same time suitable for even longer trips. You don’t need a truck to drive this trailer around, any car can do it. - Convenience: This camper trailer can be slightly raised and lowered to make it more compact while driving. When it is up it offers a spacious living area, and when it is down it becomes a low profile compact travel trailer. - Comfort: This model of Hi Lo trailers offers all the comfort you need, even if you are setting out for a long journey. It has warm water inside, a separate bathroom and a kitchen as well. The bathroom is equipped with a sink, a shower and a toilet, the perfect comfort while you travel. It can also come with an outdoor shower, which you can use if you want to shower outside in nature. The kitchen is another great characteristic of this model, having both a cooker and an oven, with enough space to cook up a delicious meal when it is raining outside. - Space: if you need a lot of storage space and comfortable places to sleep, this camper with its rear queen size bed is perfect. It has sleeping space for up to 6 people, which makes it ideal for a family. While Hi Lo camper trailers are perfect for camping and traveling, they are no longer manufactured. Because of this you can only find them second hand. Hi Lo trailer parts can be purchased at the website of Hi Lo Trailer Parts, and second hand campers one websites such as RVS Oodle and Hi Lo Trailer Forum. Some former Hi Lo Dealers are also worth to contact if you are looking for a specific model or if you need advice regarding Hi Lo campers. Here are some former dealers that can help you find a Hi Lo Trailer: Daley Camper Sales and Service, Bankston Motor Homes, Alabama RV Dealer and Tennessee RV Dealer. 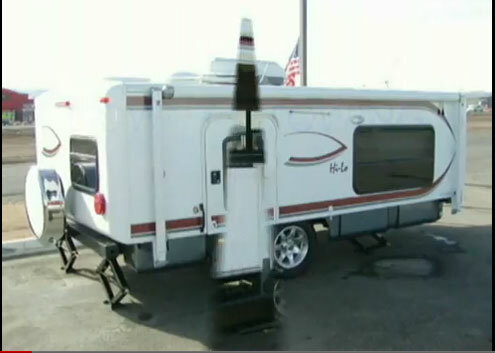 Other places that often have second hand Hi Lo travel trailers are websites such as eBay or Yakaz. These places have private sellers who offer auctions, so make sure you visit them regularly. There are new listings posted on these web pages every day. Those who demand plenty of room as well as comfort are sure to be determined to look for quality and value all wrapped into one. With Hi Lo being one of the best choices for the longer camper trailers as well as a few cab over models you are sure to find the perfect Hi Lo camper trailer for your exact needs. With models that go up to more than 27 feet, you have plenty of room to take your entire family along, or even just go by yourself or with a spouse. With plenty of features and amenities to make camping the ultimate in affordable luxury experiences there are several great reasons to choose a Hi Lo camper trailer. With several beds, a kitchen, air conditioning, and even a great little shower all included in the Hi Lo trailers this is the perfect solution for people who enjoy going camping often and need plenty of space for everyone and everything they take along. With plenty of room to bring the kids, or even your family pet you are bound to enjoy all of the great camping experiences that your Hi Lo camper trailer is able to help you achieve. Looking for a great dealership that has the perfect Hi Lo camper trailer for your needs is sure to be a pleasant and exciting task and you look around the pick our your perfect camper. Remember, there are several lengths and styles available and you are sure to find exactly what you want looking around at the options that are available on the dealership lots. From simple to complex Hi Lo camper trailers, have all of your needs covered so you can spend your time enjoying camping, rather than worrying about having enough space or the amenities that you need. There are different types of pop up campers for a wide variety of camping needs. There is really no one type or brand of camper that is better than another. Each person needs to decide which kind of popup is best suited to them, based on a number of factors like their specific need, the number of people traveling, the ages of the people traveling and a variety of other factors. Among pop up campers of different kinds, probably HI LO campers have a great advantage due to their unique design. These campers can be collapsed so that their vertical height becomes quite reduced when not in use. A lower height can result in lower aerodynamic drag when the camper is being towed. The lower height of the camper also provides a better rear view to the driver when hauling the camper. These are probably one of the greatest advantages of using HI LO campers. Of course, some people would have their own favorite type of popup camper and would vouch by them that they are the best models. But as stated earlier, each person needs to decide which is the best model for their particular need. Each person’s need varies and hence no one particular model can adequately meet the needs of every type of camper. Pop ups and the Hi Lo type of campers are probably the best for families that have small kids. These models can easily accommodate two adults and a number of children.